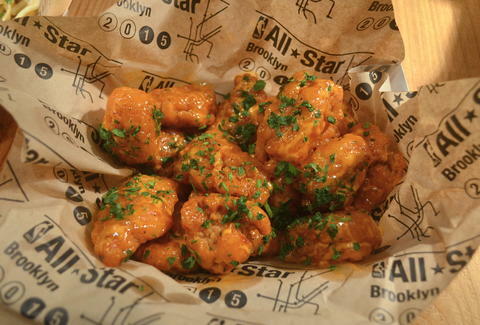 The NBA All-Star Game (and Slam Dunk Contest, and Michael Rapaport-starring Celebrity Game...) is headed to New York this weekend, and to celebrate, the Brooklyn Nets have unleashed what they're calling "All-Star Taste": a cornucopia of dishes, each representing a different NBA city. 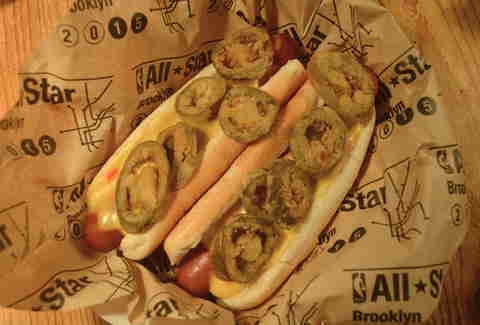 The fare will be available at All-Star events from the 13th-15th, but if you weren’t lucky enough to score tickets, fret not: the All-Star Taste Truck hit the NY streets today, on 47th St between 6th and 7th Aves (where it'll stay 'til it runs out). After that, everything'll be available inside Barclays Center -- though they've hinted at potentially keeping the most popular ones around after the All-Star Game. Anyway, in order to make your decision easier, we conducted dutiful research (read: ate enough to not be able to dunk on an 8ft rim), and listed out our favorites below. Thrillist knows full well that Phoenix is a total sleeper city for food, but these fiery chunks of fried chicken will handle waking you up. The accompanying dip soothes the tongue, and the ranch-like cream sauce is actually made from the same plant responsible for tequila. Chicago only cares about Da Bears, Da Bulls, Sausages, Ditka, and hating Jay Cutler. And also burgers. 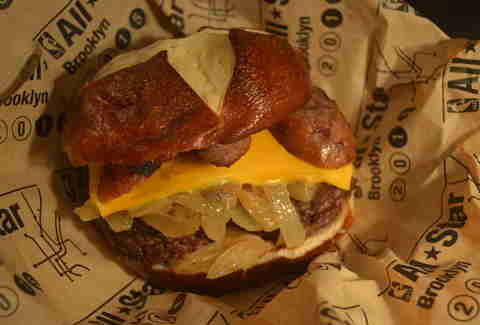 This gut-buster is daring enough to throw polish kielbasa atop fatty ground chuck, and hold it all together with a freshly-baked pretzel roll, which adds a satisfying edge of saltiness. Slightly spicy, slightly smokey, with a fresh spike of cilantro. I don't exactly see how the Bay Area can lay claim to this Vietnamese classic, but when you boast the best record in the league, you can get away with making all kinds of outrageous claims. You might not spend a lot of time thinking about Wisconsin, but when you do, perhaps cheese curds and brats come to mind. Because you are unoriginal! Either way, Milwaukee’s got a cheese dog with some added spice -- there's jalapeño in the pork, and the entire thing is topped with fried peppers. You need serious kick to cut through the melted layer of Wisconsin cheddar. To celebrate Miami, the Taste Truck went with the city’s most popular (legal) import: the Cubano. The griddled sandwich offers a satisfying sweetness from the pork and the pickles, and there’s a thick layer of melted cheese smushed in there. Brad Japhe has no problem eating his way across dozens of NBA cities, but professional basketball has been dead to him for many years -- he is a Knicks fan. You can make fun of his life choices on Twitter @braphe.